Featuring a Linear Graded GrandTouch Natural Wood keyboard with synthetic ivory keytops & escapement, the stunning Polished Ebony CLP675 Clavinova Digital Piano offers two of the world's finest grand pianos: the Yamaha CFX and Bösendorfer Imperial projected through a 2-way speaker system, as well as onboard bluetooth, digital effects, 16 track recording & 20 rhythms. The CLP-675 features long, carefully-sampled recordings of notes on a piano, reproduces them in rich detail and utilizes unique Yamaha technologies to achieve smooth tonal transitions in response to the touch of the player. Featuring Yamaha Smooth Release technology, CLP-675 offers the crisp tone heard when playing staccato as well as the lingering sound produced by releasing the keys slowly. This provides a finely-nuanced response to the pianist's playing. Pianists prefer grand pianos not only because of the way they sound, but also because of the way the keys respond to their touch. When grand piano keys are struck, there is a certain weight or resistance to the touch. Similarly, when keys are released, they return to a resting position based on the balance between the key and the internal mechanics of the keyboard. It is difficult to reproduce the natural return of the keys of a grand piano in a digital piano, due to differences in the mechanics. 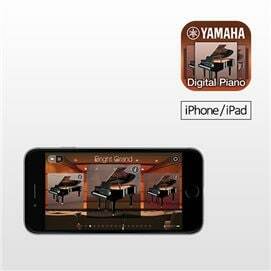 Yamaha carefully studied these characteristics when developing the GrandTouch keyboard, and has now reproduced this fine balance in the Clavinova digital piano. The result is GrandTouch - detailed grand piano feel that allows for uniform tone control, precise rhythm and smooth melodic expression - fundamental to an exceptional musical performance.